Dr. Garner has helped hundreds of clients transform their bodies and energize their health. Don't just take our word for it! Our patients are thrilled to tell the story about their journey. Find inspiration and motivation to join them on the path from before to after! All YOU have to do is Start Today! We will help you achieve the body you desire and deserve! “My coworkers told me about the challenge & I thought... Hmmm maybe that's something I can do. I had no idea it was going to change my life. This was more than a push to get motivated... It was a shove to change my life. & my families life in a positive way. Dr. Garner's work out plan & nutritional guide were amazingly easy to follow & use. The 30 day trial to the gym was just what I needed to learn that I could become the athlete I had once been before. They say the hardest thing about working out is going to the gym but really when it's basically free why wouldn't you go. Losing 50 pounds has been amazing. Continuing on my weight loss journey is exciting. Teaching others around me that there is no magic pill no fad diet just good healthy living, eating right, & working out. The very tools Dr. Garner provides you with are all that you need to shed those pounds away & add years to your life. I love all those things about this life change I have made but my greatest gift of this all is my 6 year old daughter looking at me & saying " thank you mommy for losing weight so that you will be with me for a very long time" thank you Dr. Garner for giving me the tools I needed to live again & the ability to encourage others to live a healthier life. Forever grateful for being the Biggest Loser. 50 pounds down & counting. Woo hoo!!! "My experience was great. This program was the jumpstart I needed to lose weight. The meal plan and workout really helped out and showed me what I should be eating. The meal plan was easy to follow and included lots of good foods, making it easier to stick to. My new energy levels are a great advantage to keeping up with my 7 month old son." 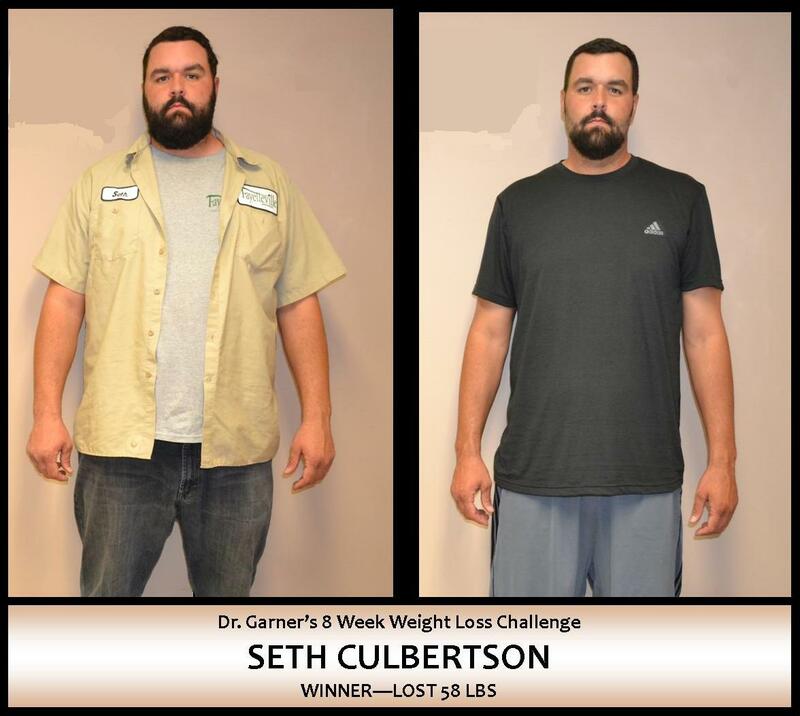 -Seth C, Fayetteville, Lost 58 lbs. "The weight loss challenge was just the jump start I needed to start losing weight. The meal plan and exercise guides were very helpful tools." "I joined the weight loss challenge to give me encouragement to stick to an eating plan. Also, to have the free month membership to the gym. I didn't lose a lot of pounds but I did lose a lot of inches and fat off my body. Dr. Garner gave me a lot of good advice I can keep with me forever." "It is 8 weeks later and I am 31 pounds lighter. I started out at 265 lbs, very weak, and very tired but with Dr. Garner's challenge I have been able to completely turn my life around. At first I didn't think I could do it but I stuck with it and now I love exercising and eating better. I know if I can do it, anyone can. Thank you Dr. Garner!" -Jennifer K, Springdale, lost 31 lbs. "We were looking or something that would provide a boost to our motivation. It very quickly became more valuable than the $1,500 prize. We learned how to live a healthy life and that we had the discipline to do it. The detailed meal plans and workouts kept us daily accountable to our goals." "The real difference for me was taking the prescribed diet seriously. I have always enjoyed exercise, but as a vehicle to eat what I wanted. Eating clean and taking the program's parameters to heart really made the difference!" -Carl P, Elm Springs, lost 24 lbs. "This plan helped me lose 43 pounds. IT changed my life. Dr. Garner is GREAT! Thanks!" -Leo G, Springdale, lost 43 lbs. "The program was great. It really helped me see where my problem areas were and how to fix them. Te workout plan really works." -April J, Springdale, Lost 19 lbs. "The challenge was extremely successful. The plan was customizable to my preferences and diet and the work out routine resulted in a loss of 30 lbs. I would recommend the program to anyone who is serious about significant weight loss." -Duncan C, Fayetteville, lost 30 lbs. "I'd like to say a sincere Thank You to Dr. Garner and his assistant Lacey at Advanced Healthcare for all their patience, support, and knowledge in helping me achieve my weight loss. Advanced Healthcare has the most up to date system of weight loss that I have seen. Also I really appreciate the jump start I received by getting a membership at World Gym. The combination of science, knowledge, and increased exercise has helped me get on the right road to a healthier, happier, and possibly even longer life. If at 54 years old I can achieve these results, you can too and Advanced Healthcare is the place to start." 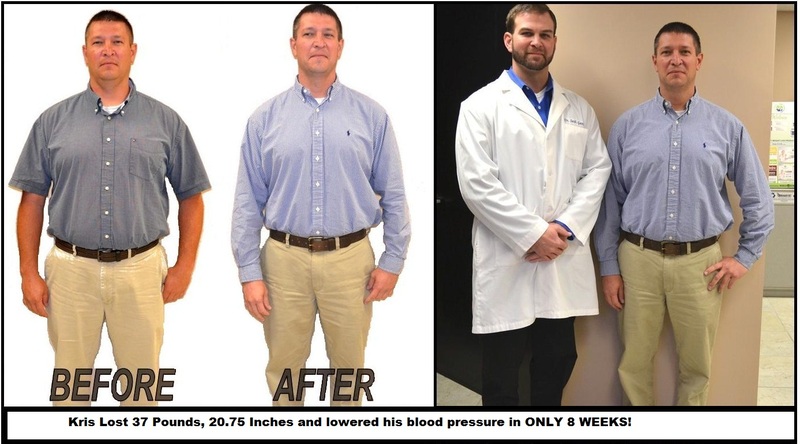 "Dr. Garner gave me the little push I needed to get me started to a healthier lifestyle. My wife also likes how much better I am heeling about myself. I now have the tools I need to reach my ultimate goal." 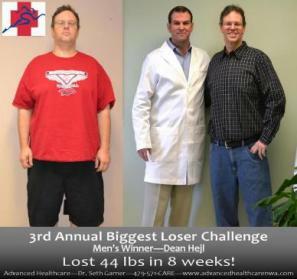 "Dr. Garner's weight loss challenge gave me the willpower to lose weight and feel better. Losing 15 pounds has helped my get into clothes that have set in my closet for 5 years. Thank you Dr. Garner." "It's been a great 8 weeks! Dr. Garner and staff are wonderful. They are very supportive and knowledgeable about your weight and health. I would highly recommend them if you are serious about your weight. Lost weight and Feel great!" "The experience had been fantastic. I have been asked so many times, "what program are you on?" My answer is that every person is on a specific program designed just for them by Dr. Garner. You will never find a more caring person than Dr. Garner and his assistant Lacey. They are awesome and have truly changed my way of life in a wonderful way." "This has been a very good experience! Not only did I see change in my body, but gained greater confidence as I take the told and the tips I learned form Dr. Garner and his staff forward. I'm feeling better and look forward to only better things ahead!" "I was pleasantly surprised with my weight loss and energy on the plan. It was easy to stick to and the results were fantastic!" "I learned a lot about how to exercise and eat healthy. It was so nice to see the good results at teach weigh in. Excited to be down 15 lbs in 13 inches total in 8 weeks"
- Christina McWhorter, Prairie Grove, lost 15 lbs. "I learned that if you set your mind to it, you can do it. Not as hard as I thought at first, now I am cautious of how I eat." "I lost 25 lbs and gained a lot of muscle, strength and I feel so much better than before. Wow, what a difference Dr. Garner's program had made in my fitness. Thanks!" "The challenge was a great experience the information and guidance I received was a great benefit from the start. I learned several new things about different foods and exercise and am now looking far beyond the 8 weeks and to remain both confident and optimistic that I can maintain the healthy new lifestyle that I have created with the knowledgeable guidance of Dr Garner and Advanced Healthcare." "Advanced Healthcares' concern and interest in my health gave me the inspiration that I could (and I DID) achieve my goals - not just losing weight- but improving my overall health." "I am forever grateful for the direction I received from Dr. Garner. I have yo-yo'd with my weight for ever and now feel like I am focused and on the right track. I have learned so much and feel like I am no longer "dieting" I have changed my lifestyle and eating habits forever. Thank You!" I have had back problems forever it seemed. Then one day I am sitting at a stop light when another car crashes into me. I was taken to the ER they x-rayed me and gave me some medication and sent me home.Then I realized that I had to take the medication because my back hurt so bad. I couldnt go to work much less put on my shoes. I wasnt sure what to do. My friend referred me to Advanced Healthcare and it was the best thing that could have ever happened to me. In a short time my pain was gone and I didnt need the medication! I was shocked all these years I have suffered. Today I am able to do things I never would have dreamed of. I can carry my grand kids, play golf and exercise. Life is good! Thank You!!! "In almost 5 months, I have lost 68 pounds and my husband has lost 50 lbs with just following my diet habits. The programs is easy to follow and the support has helped me to have the success I have had. The program works!" " Try 129 to an astonishing 210 pounds nine months later? Yes, I said it, and this was "not all baby". An unbelievable 72 pounds more than I would like to weigh( I'M 5'4"). Three years later with two incredible children at 156 still relying on the "baby weight excuse", was NO excuse. This extra weight was interfering with my life! All I could talk about was weight, which was a little like worrying about my new shoes on a rainy day. None of my past weight loss efforts- radical dieting , less sleep, long hours on the job - seemed catalytic enough for the change I was looking toward. Wherever my downward spiral started, it ended here. I started my new program as an employee of World Gym. Where I discovered the Prescription Strength Wellness Plan. I traded my meal skipping habits, including caffeine and carbohydrate overload for protein and balanced nutrition. The month of February, I started the TZX Thermal Blast with Acai. I replaced my low fat snacks with high protein , including chicken soup, offered through this plan. My accomplishments this month includes a 16 pound weight loss and a new me! Now people ask me" How did you do it?" No secrets, no tricks just results. The wall of World Gym reflects," Motivation is what gets you started, habit keeps you going". My family provides this motivation; the Prescription Strength Wellness plan keeps me going. I am starting the World Gym Bootcamp next month including the opportunity to share with others my journey toward better health and a better me. Prescription Strength Wellness Plan provided me with the tools to repair myself, one awesome change at a time. Results, direction and continued affirmations to boost my self-esteem and keep me going. My buckets of excuses are empty, what a great feeling. Want to become our next success story? For over 20 years my passion has been helping people achieve the life and health they desire.